I've been putting way too many miles on the new Avalon, 28k a year. I've debated on getting a daily to put the miles on. 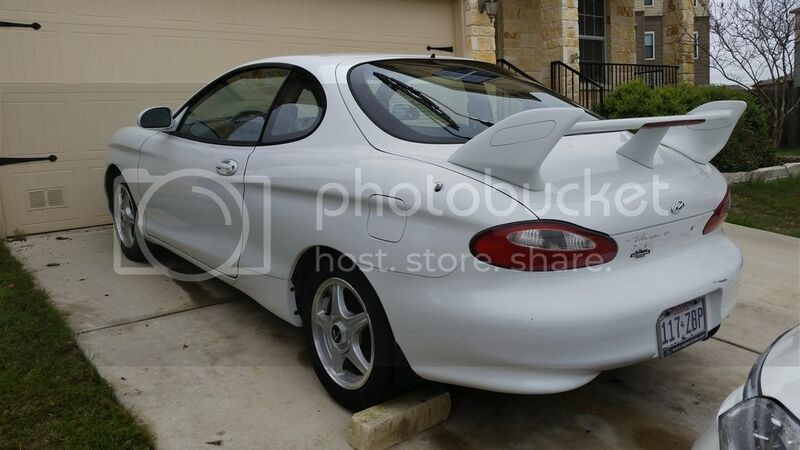 2 days ago, I paid a guy $300 for this unmolested 99 Tiburon FX. It was listed as needing a new battery and clutch. Got there and it didn't start, couldn't hear the fuel pump, and the brakes were shot. So I had no idea what worked and what didn't. But, for $300, who cares right? Brought it home and cleaned her inside and out. Found the previous owner left 3 brand new rotors in the trunk so all I needed to buy were pads. My brother just happened to have a brand new fuel pump kit lying around, so he gave that to me. After installing it, she cranked, and wanted to start, but felt like 2-3 dead cylinders. Knowing that it hadn't been started in months, maybe a year, I took off the rail to see if the injectors were spraying. 3 of them were stuck, so I bought a $4 bottle of Chemtool, soaked them for 30 minutes, put them back in, and it fired right up! Sunroof, a/c, heater, radio, windows, all work. Vehicle is going to be an excellent daily driver. The only thing left is a clutch. I just purchased a $92 XTD 6 puck kit, so we'll see how that works out. Last edited by JonGTR; 01-14-2019 at 11:49 AM. Dude, I thought you snagged my car for a sec!! Ha-ha! Thats a nice looking Tib you got there! Congrats! That thing looks MINT! How many miles are on it? You cant beat the price at all and you got the deal of the century! Thanks but definitely not mint. The front bumper is tweaked a little, I think by the crash bar. There's typical rock chips all over. And the passenger side front fender was replaced, but not painted so it's rusted. Maybe one day I'll get it all repainted. There's 107k on the odometer. Yea, it's slowly growing on me. I never see RD Tiburons in my area anymore, even though the local dealer is one of the largest and has sold a ton of them. I guess they're just too hard for some people to maintain anymore. Even now I'm buying factory parts to restore it. The door handle and ashtray are cracked. And the center console armrest is missing. Should be pretty easy to find over time. I may go to the local pick n pull to see what they have. Maybe HKC can hook you up with an Evo bumper for it. I have a lid for sale. With leather cover in great shape, brand new lid. PM me if you're interested. I'll sell you the boot and handbrake boot with it also in great shape. That guy never responded but I'm on the lookout for the bumper. I know he has it. I'll get it man. I can ship it w/o customs too. I got my all rare seats in my shed. First ever in the U.S.A.